On February 4th the Center for Teaching will held a Celebration of Learning, an exhibition of students as producers. 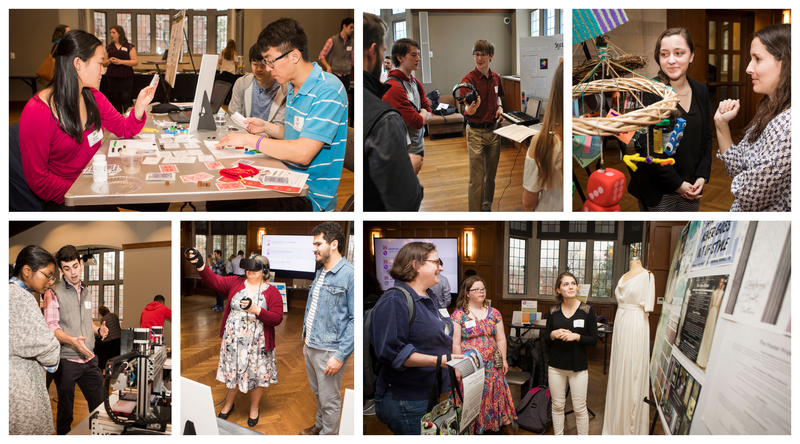 Research projects and design initiatives, podcasts and documentaries, candle-making devices and board games, clothing catalogs and virtual reality simulations… these and more were on display in Alumni Hall. All of the projects on display at the event were the result of instructors who engage their students not only as consumers of information, but producers of knowledge. The projects emerged from courses and other learning experiences where were asked to tackle open-ended problems, to operate with a degree of autonomy, or to share their work with wider audiences. All of the projects were nominated by faculty members, and all were completed in calendar year 2018. “Beyond Walls and Policies, Crisis at the U.S. Border,” a video told from a student perspective overviews a trip taken by three Vanderbilt affiliates (1 professor and 2 professional students) and how students helped serve as interpreters to Central American Refugee Caravan that had made its way to the US-Mexico Border. “Automated Liquid Handler,” a robot that can perform common biological assays at the fraction of the cost of commercial options. This liquid handler was constructed from over 50 custom parts that were 3D printed out of plastic or machined out of aluminum. “Digital Restoration of Block XI of the Parthenon’s West Frieze,” a digital restoration of a section of the Parthenon, reconstructing lost and damaged parts of the frieze. “The J. Peterman Company Catalog Reimagined,” a website replacing the luxurious descriptions for clothing items with descriptions of the sweatshops where many of our clothes actually come from in order to raise awareness to the continued existence of sweatshops. “Inside Her Head,” a multimedia experience that maps sounds to colors and projects corresponding colored lights onto musicians during a live musical performance to encourage greater understanding and accessibility of classical music. “Using Micro-CT to Investigate Fossils of Giant Triassic Marine Reptile,” a 3D jaw model that serves as a tool to study tooth features, which provide insights into the evolution and ecology of an extinct marine predator. At 2018 event, more than 100 faculty, staff and students attended the event in Alumni Hall, which featured three rooms of student work: an exhibition hall with posters and projects, a digital media hall featuring podcasts and more, and a presentation hall with screenings and talks. Most all of the 34 projects on exhibit were created by students as part of coursework here at Vanderbilt. Students shared podcast episodes, short films, webcomics, manufacturing equipment, oil paintings, service learning projects, design thinking projects, laboratory research, a mural, a board game, a computer roleplaying game, a policy brief, a magazine, a photo essay, and much more. All of these projects were the result of instructors who engaged their students not only as consumers of information, but producers of knowledge. The projects emerged from courses and other learning experiences where students were asked to tackle open-ended problems, to operate with a degree of autonomy, or to share their work with wider audiences. All of the projects were nominated by faculty members, and all were completed in calendar year 2017. “Existing Quietly, Living Loudly,” a first-person webcomic on identity and culture created by Elizabeth Lee that describes how her identity has been a significant lens through which she interacts and interprets the world around her. “Waste Reduction for Turner Construction,” a plan for how to reduce construction and demolition waste by creating a warehouse that buys unused construction materials and resells the materials to other contractors or families, sending less waste to dumpsters. “Genetic Screen for Genes Involved in Paternal Mitochondrial DNA Elimination in C. Elegans,” a genetic screen to identify genes involved in paternal mitochondrial DNA (mtDNA) elimination.